1 The Philistines now mustered their army for battle and camped between Socoh in Judah and Azekah at Ephes-dammim. 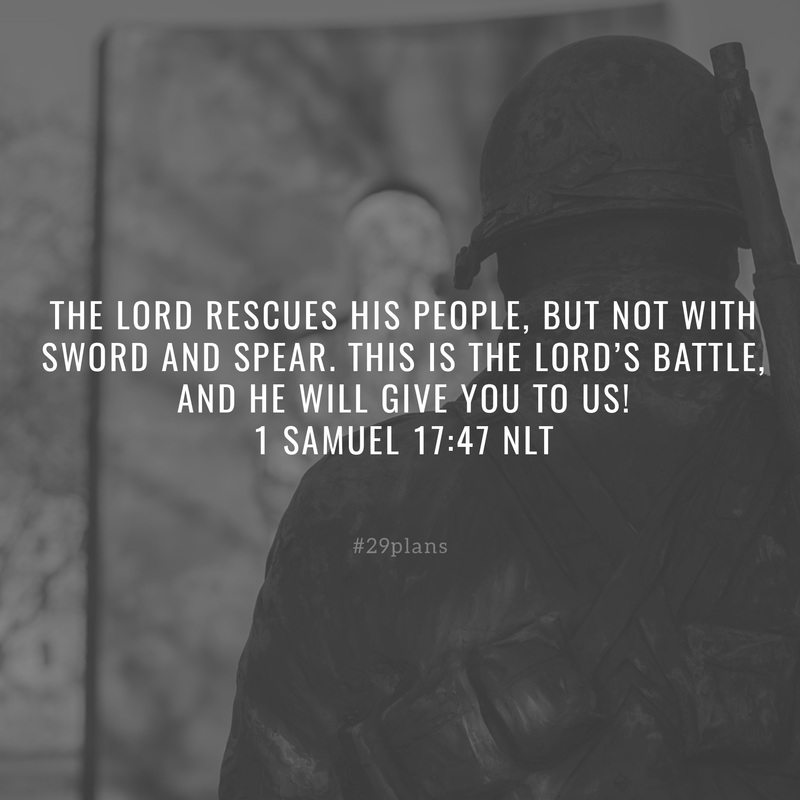 2 Saul countered by gathering his Israelite troops near the valley of Elah. 3 So the Philistines and Israelites faced each other on opposite hills, with the valley between them. 4 Then Goliath, a Philistine champion from Gath, came out of the Philistine ranks to face the forces of Israel. He was over nine feet[a] tall! 5 He wore a bronze helmet, and his bronze coat of mail weighed 125 pounds. [b] 6 He also wore bronze leg armor, and he carried a bronze javelin on his shoulder. 7 The shaft of his spear was as heavy and thick as a weaver’s beam, tipped with an iron spearhead that weighed 15 pounds. [c] His armor bearer walked ahead of him carrying a shield. 8 Goliath stood and shouted a taunt across to the Israelites. “Why are you all coming out to fight?” he called. “I am the Philistine champion, but you are only the servants of Saul. Choose one man to come down here and fight me! 9 If he kills me, then we will be your slaves. But if I kill him, you will be our slaves! 10 I defy the armies of Israel today! Send me a man who will fight me!” 11 When Saul and the Israelites heard this, they were terrified and deeply shaken. 12 Now David was the son of a man named Jesse, an Ephrathite from Bethlehem in the land of Judah. Jesse was an old man at that time, and he had eight sons. 13 Jesse’s three oldest sons—Eliab, Abinadab, and Shimea[d]—had already joined Saul’s army to fight the Philistines. 14 David was the youngest son. David’s three oldest brothers stayed with Saul’s army, 15 but David went back and forth so he could help his father with the sheep in Bethlehem. 17 One day Jesse said to David, “Take this basket[e] of roasted grain and these ten loaves of bread, and carry them quickly to your brothers. 18 And give these ten cuts of cheese to their captain. See how your brothers are getting along, and bring back a report on how they are doing. [f]” 19 David’s brothers were with Saul and the Israelite army at the valley of Elah, fighting against the Philistines. 17:4 Hebrew 6 cubits and 1 span [which totals about 9.75 feet or 3 meters]; Dead Sea Scrolls and Greek version read 4 cubits and 1 span [which totals about 6.75 feet or 2 meters]. 17:5 Hebrew 5,000 shekels [57 kilograms]. 17:7 Hebrew 600 shekels [6.8 kilograms]. 17:13 Hebrew Shammah, a variant spelling of Shimea; compare 1 Chr 2:13; 20:7. 17:17 Hebrew ephah [20 quarts or 22 liters]. 17:18 Hebrew and take their pledge. 17:52 As in some Greek manuscripts; Hebrew reads a valley.